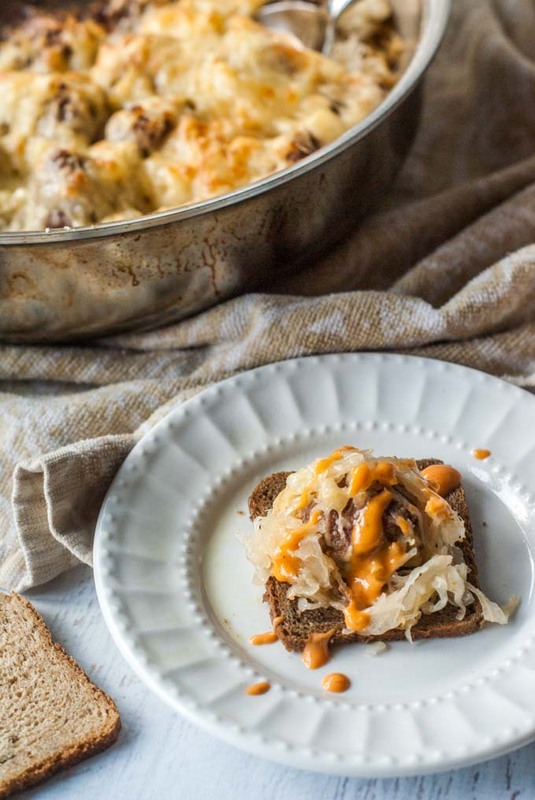 Savory Reuben Meatballs for any Party or Occasion! 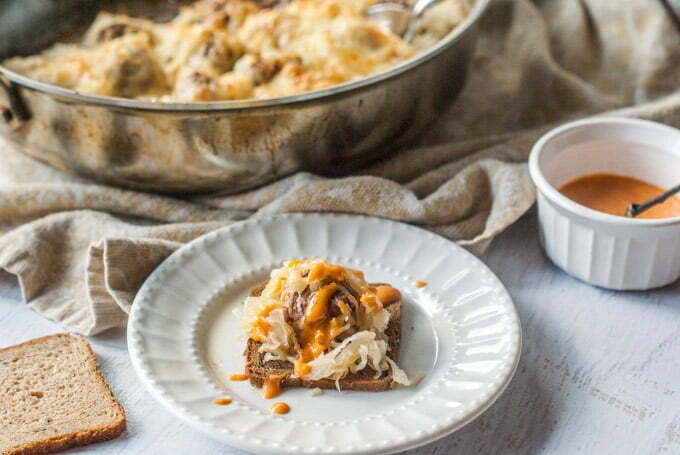 These savory Reuben meatballs make a fun appetizer for your next party or a tasty dish to eat while watching the big game. My husband is a big Reuben sandwich kind of guy. I, myself have never really eaten one until recently and I can see why he loves them so much. It’s salty, sweet, tangy and well just all around delicious. 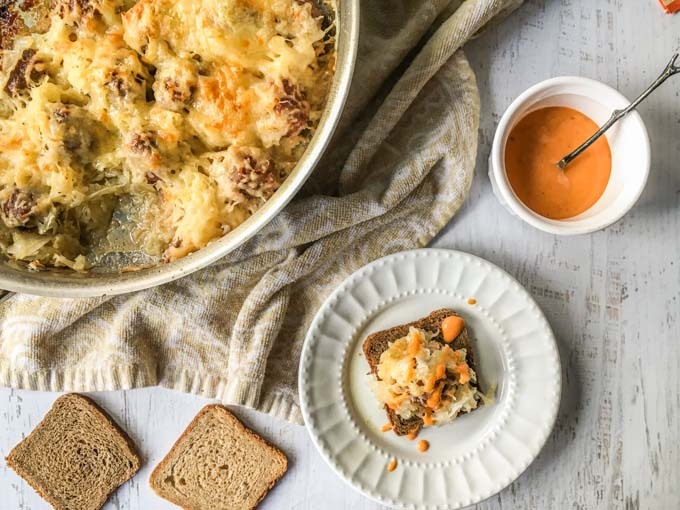 I thought today I’d that those tasty Reuben flavors and make them into a savory Reuben meatball appetizer. 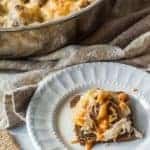 This is a fun dish to take to a party or to sit in front of the tv and eat as you are watching the game (like my husband did). I don’t know about you but sometimes it’s hard to find something different to take to parties. However, I find that everyone loves a good meatball. Whenever I make the old grape jelly and chili sauce meatballs, everyone loves them but it’s me who wants something different. I guess that is why Pinterest was invented – to give us new options and ideas! I tried to keep this as simple as possible because quite frankly that is the way I cook. 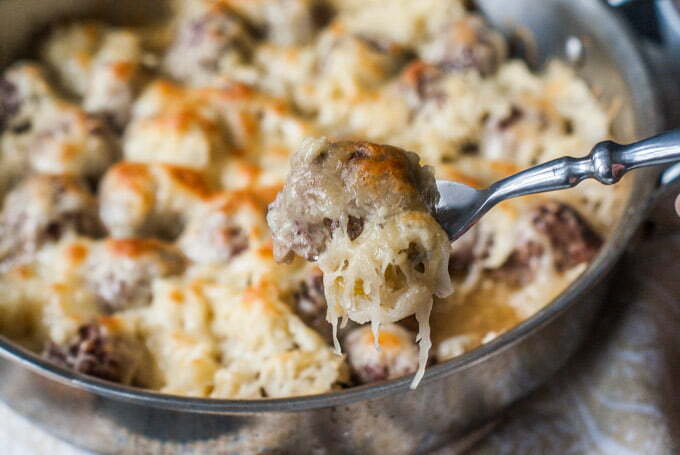 The savory Reuben meatballs are a mixture of ground beef, corned beef, and an egg. The first batch I made I didn’t use enough corned beef but the second batch seemed much better. I used 1 lb of ground beef to 1/2 lb of corned beef. I ran the corned beef through the food processor to grind it up. Then I just browned them in a pan on the stove, added some sauerkraut and gruyere cheese and baked in the oven. When they came out I had little pumpernickel and rye bread toasts to eat with the meatballs along with Thousand Island dressing. Even the first batch was delicious in my opinion. I think I’m hooked on Reubens now. Well, I hope you think of this recipe the next time you need to bring a dish to a party. Because I made this a few times we even ate it for dinner. My husband loved them! I hope you do too. Enjoy! If you are making these for St. Patrick’s Day, take them along with my Jennifer’s Corned Beef Sliders and some slaw! Denise is a healthy food blogger that likes to create low carb recipes that she and her family love. All her recipes are quick and easy but most of all tasty. You can find her recipes at My Life Cookbook or through her Facebook, Pinterest or Instagram pages. In a food processor add the corned beef and pulse to grind the meat. Add the corned beef, ground beef, salt, pepper, and egg in a large bowl and mix well. Form the meat into meatballs. This batch made 30 meatballs for me. Keep in mind the size of the toast when making them. Add some oil to an oven-safe pan and brown the meatballs. When the meatballs are browned, sprinkle the sauerkraut over them and then top with the shredded cheese. Bake for 15 – 20 minutes. You may want to pop it under the broiler afterward to brown the cheese. Serve with mini toast and Thousand Island dressing. Oh man, these look so good! You can’t beat meatballs! I would totally make these for dinner or lunch or anytime. We love Ruebens and this is a keeper! These are genius! Can’t wait to try them.